We normally steep this tea for 3 minutes, but occassionally let it steep for 5, either way it is quite delicious. We love this very unique and flavorful green tea! This is just the third year for this Yunnan green tea for us, although we have tasted many that have been similar to it over the years. It has a much deeper presence this year than it did the last two years (because of the more normal amount of rainfall this winter) and will be a great addition to the very early Spring Green Teas that come primarily from western China, in this instance the southwestern portion of Yunnan Province where the Mekong River joins China, Burma, and Laos. We are thrilled to have this tea, and know that those of you who have been looking for a delicious, hearty green tea at a reasonable price point (and that should be available throughout the drinking season) will be happy that we have added this delicious green tea to our selection. This is exactly the type of green tea that the domestic Chinese drink throughout the year, from spring to spring, or for as long as the crop lasts. This tea is not to be confused with the light and stylized Spring Green Teas that we think of as being from the early season harvests. This beautiful leaf just happens to mature quickly due to the growing conditions (terroir) in which it thrives. While it is picked early due to the quick warming of the place in which it grows, it will keep much better than its early-picked cousins from eastern China. 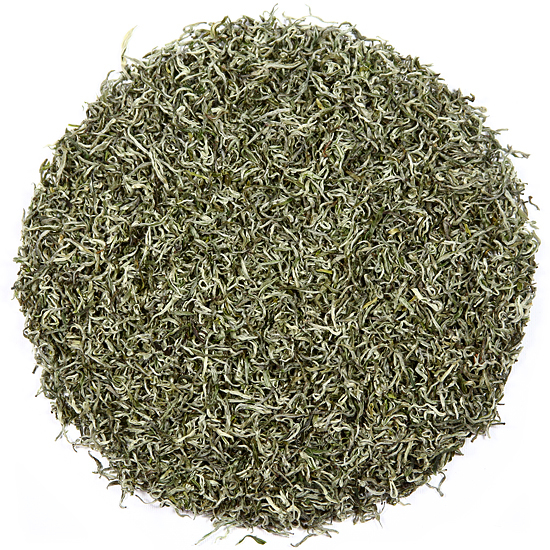 Our Yunnan Strands of Green with Silver Tips is a bud-and-leaf tea, ( a mao jian) plucked in the early part of the tea season, as soon as the weather warms in Yunnan Province. Because these leaf materials were picked and manufactured when they were so young, the tea is a lovely greenish-white-silver color. In the cup this tea is fresh and delicious – full-bodied, focused, and rich – a lovely combination of flavor and aroma that satisfies and soothes at the same time. The tea has a unique core flavor – soft, chestnut-y, fairly vegetal (think artichoke and celery) with a little Asian pear … flavors that are a result of the special nature of the indigenous tea bushes that grow in this region. While this tea has some early spring sweetness in the aroma of the dry leaf and in the cup, it is more earthy in style and less ‘showy’ than the eastern China spring green teas. It has significant, wonderful hui gan (aftertaste, or ‘returning flavor’) with medium, very pleasant astringency. The flavor of this tea is nuanced, sweet, and while somewhat subtle it is also somewhat bold – a hallmark of Yunnan green teas. So, this tea is perfect for those who want a slightly lingering aftertaste, following fleeting moments of flavor that are revealed with each sip. The slightly-twisted green ‘needles’ are smooth and fully-formed . This tea was made from sturdy leaf, and should steep successfully several times. The color of its liquor is that of a young Sauternes – perfect clarity and a beautiful hue (not, as Julia Child was fond to note, the urine color of an older, oxidized Sauternes!). This tea is a wonderful example of the tea artist’s craft and the care given to premium, artisan tea during leaf manufacture. It is also extremely well-priced – in fact, it is a ‘steal’ in these modern times of escalating prices due to high demand on the domestic Chinese market.